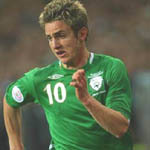 Wexford born, Kevin Doyle could have made it in GAA as well as soccer and made several appearances for Wexford's Under 21 footballers before joining St Patrick's Athletic in 2002. 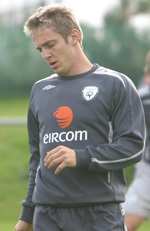 With his direct style of play, the striker became an instant favourite at Richmond Park though he was soon off to Cork City. He was a member of the World Youth Championships squad. Kevin's regular goal-scoring exploits for Cork led to his transfer to Reading for the 2005/'06 season. On 7 June 2005, Doyle signed for Reading from Cork City for €117,000 (about £78,000). Despite having left Cork City, Doyle received a championship medal when they won the eircom League Premier Division in November 2005. Originally, he was signed as a back-up, but injuries to other players elevated him to the first team where his natural goalscoring ability and defence-splitting speed resulted in a goal-scoring spree. He became an intrinsic part of Reading's Championship-winning 2005-06 squad, and according to the Actim Index was one of the top players in the Championship. 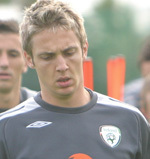 Doyle has played for the Republic of Ireland U21 team, debuting on 2 February 2004 against Portugal. 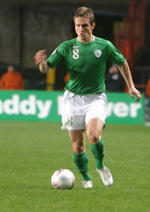 With 11 caps, and scoring five goals, he was also a member of the Irish FIFA World Youth Championship squad in 2003.He was called up to the Irish international squad in October 2005, making his international début against Sweden at Lansdowne Road on 1 March 2006.His first start in a competitive international was against Germany on 2 September 2006 in a Euro 2008 qualifier. With this appearance, his family also won a €100 bet at 100/1 they had placed two years earlier on Doyle playing competitively for Ireland. Last 10 games in which Kevin Doyle scored. Games in which Kevin Doyle was a Substitute.